It was the mid-eighties, I’m home in St. Louis and me and my cousin are in the Central West End hanging out at Metro Video, which I’m sure is long closed by now, trying to pick out a movie. She wants to watch ‘Beat Street’ again. Not happening. Since I’m the one with the pocketful of money from that phat job working at Jack-in-the-Box, I make the selections of ‘Blood Sucking Freaks’ and this movie ‘Shogun Assassin’. Should the irresponsible video clerk be renting this stuff to a couple of teenagers? Of course not. Just so you know, at no time… ever… will ‘Blood Sucking Freaks’ be revisited by the website. Ever. Anyway, later that night we watch ‘Shogun Assassin’ and a legend is born. Seared into my brain. One of those movies you watch as a kid that never leaves your memory. How far can nostalgia carry you when revisiting a movie close to three decades later? The Samurai master has gone nuts. After you take one look at him, with his wild white hair, bulging eyes, arching eyebrows and that crazed look on his face, it’s pretty damn clear that this cat has lost his mind. But he’s still the King of the Samurai and he’s still oppressively oppressing his people. For whatever reason this dude has become distrustful of his top Samurai Ogami (Tomisaburo Wakayama) even though Ogami hasn’t done anything accept love his wife and child as far as I can tell. So distrustful he is of Ogami that he has dispatched some of his Ninja Assassins to take Ogami out, but the only person they managed to kill was Ogami’s wife. They don’t look anything alike so who knows how that happened, but recognize that Ogami is now PISSED THE F@#K OFF! Ogami has made the decision to do some things that will cast him in an even darker light with the Samurai and he needs to know if his baby boy is on board with the hellish road they are about to take. Of course this is one of the legendary scenes in cinema, even to this day, and knowing that his boy will be with him, Ogami goes about the business of slaughtering himself some worthless, unprepared samurai. The boy, Diagoro (Ahikiro Tomikawa), will narrate for us as he and his old man travel the countryside, the little boy in his lethal baby cart, while keeping an eye out for assassins, and occasionally taking the paid murder gig to help pay the bills and buy a hot meal every once in a while. But the order of the day for Ogami and Diagaro are the assassins as they are never ending, relentless, vicious, and diabolical. Especially Supreme Ninja over there (Kayo Matsuo) who is prone to cackling, running backwards and ultimately not doing her freaking job. Blood splatter, decapitations, dismemberment and the Three Masters of Death shall ensue. 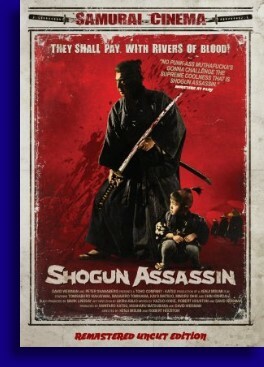 As most of you are already aware, ‘Shogun Assassin’ is a re-edit of the first two ‘Lone Wolf and Cub’ films directed by Kenji Misumi back in the early seventies. There are six of these films and I own all six, but I have to admit I haven’t watched a single one… though I do plan to one day… but I haven’t watched the original film series mainly because of my warm feelings towards ‘Shogun Assassin’. I know that that the original series will be superior to the bastardized ‘Shogun Assassin’, I know the story being told will have more depth and have a better flow to it, I know that listening to the actors in their natural voices will easily trump bad voice dubbing almost any day of the week and I’ll probably never want to watch ‘Shogun Assassin’ ever again. I know all of this already, but I’m just not quite ready to give up on the warm fuzzy that I still have for ‘Shogun Assassin’. Watching the movie years later, the choppy nature of the narrative is more apparent, there are other elements of the tale which are open ended and will never be resolved, but what is still intact is the relationship between Ogami and his baby boy Diagoro, highlighted by Diagoro’s narration which is probably the element of the 1980 version that changes it most significantly from the original versions. Also still remaining from the original versions is blood splatter, beheadings, dismemberments and chaos. Probably more so since I’m fairly certain that the things director Robert Houston cut out most were critical story elements and dialog, but left in as much carnage as the law would allow. The thing that always struck me most about this movie the first time I saw it back in the 80’s was how brutally violent it was. Years later… a little more jaded… the movie is still brutally violent but today watching someone get their arm cut off and watching the blood spray in a gush of red 100 feet across a meadow is almost comical. The late Tomisaburo Wakayama is still the ultimate in cool, a man who says few words and what few words he does say, you’d better listen, the story might’ve been hacked to make less sense but it still finds a way to logically connect the carnage, and even after all these years ‘Shogun Assassin’ is still immensely entertaining. One day we’ll get around to our ‘Lone Wolf and Cub’ collection, but we’re not quite ready to let ‘Shogun Assassin’ fade away just yet.